The organ­i­sa­tion of exhi­bi­tions always takes the form of a project. Project man­age­ment there­fore plays a cen­tral role in the process. If the aim is to organ­ise an exhi­bi­tion well, a good basic under­stand­ing of project man­age­ment is impor­tant. In view of this an intro­duc­tion is included below which pro­vides a broad overview of the sub­ject. For a more in-depth under­stand­ing, please refer to the many pub­li­ca­tions avail­able in this field. An inter­nal (usu­ally, the man­age­ment of an organ­i­sa­tion) or exter­nal client. Projects can take many forms from sim­ple ones such as organ­is­ing a hol­i­day or a din­ner with friends, to extremely com­plex ones such as the build­ing of a pas­sen­ger ship or the con­struc­tion a high speed ​​train. Projects do not always need to have a mate­r­ial prod­uct as the out­come either. Writ­ing a pol­icy or doing research can also be con­ducted on a project basis. This model focuses on projects in the field of spa­tial com­mu­ni­ca­tion, such as the estab­lish­ment of a flag­ship store, the imple­men­ta­tion of a trade show stand, the organ­i­sa­tion of a sci­ence cen­tre or a pavil­ion at an inter­na­tional exhi­bi­tion, as well as the estab­lish­ment of a per­ma­nent or tem­po­rary exhi­bi­tion in the her­itage sector. Projects gen­er­ally flow from the work of a per­ma­nent organ­i­sa­tion, such as a cul­tural insti­tu­tion, a gov­ern­ment organ­i­sa­tion or a busi­ness. Through the run­ning of such an organ­i­sa­tion needs can arise for unique or one-off prod­ucts like, for exam­ple, a cus­tomer sur­vey, a fea­si­bil­ity study for a new loca­tion, the devel­op­ment of new prod­ucts, the con­struc­tion of a new build­ing, a re-organisation, a new pol­icy, etc. In many set­tings unique or one-off prod­ucts form (a part of) their end prod­uct, for exam­ple in museum exhi­bi­tions or designs for exhi­bi­tions at a design agency. Since projects do not often form the core busi­ness of an insti­tu­tion or busi­ness and are an anom­aly for them, much of the essen­tial know-how is lack­ing. Many projects are there­fore wholly or par­tially car­ried out by exter­nal spe­cial­ists. When the project is com­pleted, the prod­uct returns to the exist­ing organ­i­sa­tion. This is aimed at main­tain­ing the prod­uct, which is often of a rou­tine nature and can be car­ried out accord­ing to estab­lished procedures. Above project man­age­ment is described as the sys­tem­atic and con­trolled steer­ing of a sin­gle result-orientated process which must be exe­cuted within given para­me­ters of time, money and resources, on the basis of pre-defined objectives. In order for a project to be sys­tem­at­i­cally steered and con­trolled the fol­low­ing five aspects must be con­trolled in an inte­grated and coher­ent way: time, money, qual­ity, infor­ma­tion and organisation. The aim is to deliver the project on time and this encom­passes struc­tur­ing the project into phases, the estab­lish­ment and mon­i­tor­ing of plans and, where nec­es­sary, the mak­ing of interim adjust­ments to these plans. The prepa­ra­tion of fore­casts for the costs to be incurred: In the begin­ning of the project this is often based on gen­eral expe­ri­ence expressed in prices per square metre and ratios. As the project becomes more solid, these fore­casts become more pre­cise and detailed, result­ing in more and more con­crete cost estimates. The cov­er­ing of the costs: This has to do with income sources like avail­able bud­get, expected rev­enues (e.g. from entrance fees at an exhi­bi­tion) and, if nec­es­sary, from fundrais­ing or other forms of financing. The con­stant mon­i­tor­ing of cost devel­op­ments, costs esti­mates and bud­gets: These are checked against the (revised) project bud­get and if applic­a­ble against rev­enue from fundrais­ing (bud­get control). Assess­ing the qual­ity and ambi­tion of the project: Qual­ity refers to sub­stan­tive and tech­ni­cal require­ments and is a result of the avail­able money, time and resources (e.g. amount of man­power and exper­tise). In deter­min­ing the qual­ity of struc­tural projects such as exhi­bi­tions, aspects of sus­tain­abil­ity can be involved. The qual­ity require­ments need to be real­is­tic. In prac­tice it often turns out that a (much) too ambi­tious level is sought after for which the bud­get is alto­gether too low (want­ing a Rolls Royce for the price of a Volk­swa­gen), that the time is too short (want­ing it done yes­ter­day) and/or the resources are insuf­fi­cient (hav­ing only a group of vol­un­teers with lit­tle expe­ri­ence and knowl­edge of the essen­tial project sub­jects). In exhibition-making espe­cially, the costs, time and essen­tial know-how required to achieve a pro­fes­sional prod­uct are often under­es­ti­mated by clients. Hav­ing qual­ity require­ments and ambi­tion lev­els that are too high at the start can often lead to the fail­ure of the project and frus­tra­tion amongst those involved. Depend­ing on the knowl­edge and expe­ri­ence of the client, it is worth set­ting real­is­tic qual­ity require­ments and estab­lish­ing them through good con­sul­ta­tion between the client and the con­trac­tors. The exper­tise and expe­ri­ence of the con­trac­tors can be used in this way to come up with a fea­si­ble level of ambi­tion. Inci­den­tally, “qual­ity” also has to do with achiev­ing the goals set in advance. An exhi­bi­tion that gets its objec­tives from selected tar­get groups has in that sense, a good level of quality. The interim check­ing of the qual­ity level: This is tested against the level that has been deter­mined at the begin­ning of the project. It is rec­om­mended that the detailed project plan – called the Pro­vi­sional Design in exhi­bi­tions — ensures that it rep­re­sents the 100% solu­tion in terms of achiev­ing both the project objec­tives and the fea­si­ble qual­ity for that project. In prac­tice, it often turns out that dur­ing the sub­se­quent exe­cu­tion and imple­men­ta­tion of the project var­i­ous adjust­ments need to be made​​. In direct con­sul­ta­tion with the client, usu­ally in the con­text of “con­struc­tion” meet­ings, these adjust­ments can be dis­cussed and checked against the detailed project plan. In gen­eral, adjust­ments lead to a reduc­tion in qual­ity. Expe­ri­ence shows that a project that gets 80% of the desired qual­ity is per­form­ing well. Qual­ity con­trol must also be real­is­tic. Adjust­ments should be pos­si­ble, pro­vided they are not of such a nature that the whole project or parts of it fall below the level where it is no longer cer­tain that the objec­tives of the project will still be met. Infor­ma­tion man­age­ment is divided into two parts. Inter­nally and exter­nally ori­ented infor­ma­tion control. The pro­duc­tion and dis­cus­sion of reports: This mainly con­cerns reports where the results of the work and con­clu­sions from a project phase are recorded, the so-called ‘deci­sion doc­u­ments’. Given the impor­tance of the ‘deci­sion doc­u­ments, it is essen­tial to record dis­cus­sions in reports. Giv­ing brief­ings: These may be given to exter­nals and/or team mem­bers on the tasks to be car­ried out by them. Hold­ing reg­u­lar project and/or con­struc­tion meet­ings: In prac­tice, a fre­quency of once to a max­i­mum of twice a month is real­is­tic dur­ing the prepa­ra­tion and design phases of an exhi­bi­tion project. Dur­ing the con­struc­tion phase, a higher fre­quency is effec­tive of at least 2 per month to some­times once a week (in the final stage). The mak­ing of meet­ing reports with action lists: For good infor­ma­tion man­age­ment it proves effec­tive when project team mem­bers make a brief cor­re­spon­dence report of dis­cus­sions they have with exter­nals which is then cir­cu­lated. Archiv­ing records and mail cor­re­spon­dence in project doc­u­men­ta­tion is of vital impor­tance here. In this con­text it is good to appoint a project sec­re­tary who car­ries this out and is account­able for it. In order to set up proper project doc­u­men­ta­tion all doc­u­ments should con­tain a ver­sion num­ber, the date and the name of the author. Infor­mal cor­re­spon­dence via email and tele­phone: Con­straint should be observed with email cor­re­spon­dence. Often a ques­tion to a project asso­ciate gets sent to all project mem­bers, who then in turn reply to every­one. When this hap­pens in an uncon­trolled way an infor­ma­tion over­load is caused that is not only inef­fec­tive, but often arouses irri­ta­tion too. With ram­pant email cor­re­spon­dence you often hear talk of ‘email-mania’. The idea that every­thing can be con­trolled via an “email” is becom­ing out­dated. Email is an effi­cient tool for inter­nal com­mu­ni­ca­tion, but also has its lim­i­ta­tions, par­tic­u­larly in terms of the inter­pre­ta­tion of text (mis­com­mu­ni­ca­tion), and relat­ing to the time spent on it. A con­sul­ta­tion on a par­tic­u­lar sub­ject can be com­mu­ni­cated con­sid­er­ably more effec­tively in a phone call or a short infor­mal 5 min­utes meet­ing than in an email exchange last­ing 30 min­utes. The con­clu­sions can then be con­firmed via an email. In short, a selec­tive use of the var­i­ous infor­mal forms of com­mu­ni­ca­tion is nec­es­sary for good inter­nal communication. Inter­nal infor­ma­tion pro­vi­sion is often seen as a respon­si­bil­ity of the project man­ager. Even though he has a coor­di­nat­ing and super­vi­sory role in this, all team mem­bers have a respon­si­bil­ity for infor­ma­tion pro­vi­sion. All the work the team mem­bers carry out and the con­sul­ta­tions they have should be informed by the basic prin­ci­ple: who needs to know the results of this? In order to avoid the above-mentioned email-mania this needs to be car­ried out in a very selec­tive way. This refers to the infor­ma­tion about the project and its pro­gres­sion to third par­ties out­side of the project group and client. Often exter­nal infor­ma­tion man­age­ment is a task of the client. In exhi­bi­tions this can form part of the gen­eral and/or the project-targeted pro­mo­tion of the com­mis­sion­ing insti­tu­tion or com­pany. Mount­ing a project pro­mo­tion cam­paign right from the start fol­low­ing the devel­op­ments of the project can con­tribute sig­nif­i­cantly to its suc­cess. Fur­ther­more such cam­paigns have been mainly applied to larger exhi­bi­tion projects such as the refur­bish­ment of a museum. com­mu­ni­ca­tions to staff, whether or not as part of a reg­u­lar appear­ing newsletter. For the con­duct of inter­nal and exter­nal infor­ma­tion pro­vi­sion it is advis­able to set up an Infor­ma­tion Pro­to­col at the begin­ning of the project. Arrange­ments can be made herein about who will be informed about what and at what moment and which com­mu­ni­ca­tion chan­nels will be used as a preference. what the decision-making struc­ture is? The client is ulti­mately respon­si­ble for the project and has the task of tak­ing final deci­sions con­cern­ing the project, encap­su­lated in phase results and final deliv­er­ables. A client can be either inter­nal, i.e. com­ing from within the organ­i­sa­tion, or exter­nal. Usu­ally, the client func­tions as the direc­tor or head of a depart­ment, e.g. from the com­mu­ni­ca­tions depart­ment of a large com­pany that wants to run a stand at a trade show. As an excep­tion to this is when the board of an insti­tute or foun­da­tion is the client, for exam­ple in a museum run by vol­un­teers. In com­mer­cial con­texts the term cus­tomer is also used. tak­ing deci­sions on the basis of per­sonal emo­tions or by impos­ing deci­sions rather than on the basis of busi­ness con­sid­er­a­tions con­nected to the objec­tives of the project. is respon­si­ble for the proper con­trol and mon­i­tor­ing of the five con­trol aspects through estab­lish­ing and mon­i­tor­ing work plans, bud­gets, organ­i­sa­tion charts for the project and any infor­ma­tion protocols. Usu­ally the project leader directs the project team, is present at project meet­ings and main­tains con­tact with the client. The man­ag­ing and super­vi­sion of third par­ties (sub­con­trac­tors, sup­pli­ers and ser­vice providers), as well as exter­nal infor­ma­tion ser­vices often falls under his/hers responsibilities. Project lead­er­ship takes many forms depend­ing partly on not only the actual nature and scope of the project, but also on the cul­ture of the insti­tu­tion in which the project takes place and the per­son­al­ity of the project leader. For large projects, and also within larger hier­ar­chi­cally organ­ised insti­tu­tions and busi­nesses, the style will be more ‘dirigiste’ and business-like in which the over­all respon­si­bil­ity and thus the decision-making lies more directly with the project leader. For smaller, more cre­atively ori­ented projects such as exhi­bi­tions, the man­age­ment style is often of a more coor­di­nat­ing and stim­u­lat­ing nature where the project leader takes deci­sions based on cor­po­rate outcome-related rea­sons from the team, but where nec­es­sary also on their own respon­si­bil­ity. Cen­tral to this idea is to opti­mise the final prod­uct by always allow­ing space for the cre­ativ­ity, knowl­edge and expe­ri­ence of pro­fes­sion­als within clear frameworks. Within a pro­fes­sional project, the project mem­bers are cho­sen on the basis of busi­ness con­sid­er­a­tions, i.e. accord­ing to the essen­tial know-how needed for the project. This can vary by phase or group of phases. In the early phases of exhi­bi­tion projects content-related and cre­ative skills are mainly desir­able. When the project plan is ready, in the form of a ‘pro­vi­sional design’, and the exhi­bi­tion project is in more of an imple­men­ta­tion phase, more archi­tec­tural and spe­cific know-how is required, for exam­ple for the pro­duc­tion of audio-visual pro­grammes and inter­ac­tive exhibits. The project team is also often mod­i­fied and extended in later phases. In recent years there has been a ten­dency to involve builders and man­u­fac­tur­ers from the start of the project, in an effort to antic­i­pate the essen­tial know-how required in later phases. Although these spe­cial­ists do not have a direct role in the begin­ning phases, it may be that through their knowl­edge and expe­ri­ence in the field of organ­is­ing and real­is­ing exhi­bi­tions they make pos­i­tive con­tri­bu­tions to this first phase. This method also has the advan­tage that it can quickly build a good team spirit and increases effi­ciency as par­ties do not need to be inte­grated at a later stage. The dis­ad­van­tage is of course choos­ing par­ties at an early stage who will only play an active role in a later phase. With large exhi­bi­tions projects this way of work­ing leads to so-called con­sor­tia. Here you find a num­ber of com­pa­nies who are spe­cialised in dif­fer­ent areas com­mit­ting them­selves to ten­der for the project as a ser­vice provider. These are often alliances of communication-/content-oriented com­pa­nies with design­ers and exhi­bi­tion con­struc­tion com­pa­nies. Some­times muse­o­log­i­cal and audio-visual spe­cial­ists are also a part of such consortia. Finally, it should be noted that a team of renowned spe­cial­ists are not the most appro­pri­ate team per se. The best result is achieved by a team of co-operating spe­cial­ists who under­stand their duties and roles within the team and respect those of oth­ers. Projects dom­i­nated by one spe­cial­ist will ulti­mately gain a more one-sided result, thereby only ful­fill­ing part of the objectives. Fol­low­ing on from deter­min­ing those involved in the project is the essen­tial step of record­ing their duties, respon­si­bil­i­ties and pow­ers. The start­ing point here is that one does not acquire respon­si­bil­i­ties with­out the cor­re­spond­ing pow­ers. A well-known exam­ple is the project man­ager who is respon­si­ble for the project bud­get but does not have the author­ity to make changes within the approved total bud­get or to nego­ti­ate par­tial bud­gets with third par­ties. The absence of these pow­ers erodes not only his task as autho­ris­ing offi­cer, but also cre­ates an inef­fi­cient course for the project because every change must be sub­mit­ted to the client. If the bud­get is such that the client can­not or will not hand over bud­get respon­si­bil­ity entirely, it may be decided to give the project leader a cer­tain amount in order to allow some power of decision-making. Also with regards to the hir­ing of third par­ties and the hir­ing of per­son­nel sim­i­lar arrange­ments can be made. the power within the approved frame­work of the project to give assign­ments to the project staff and to nego­ti­ate with con­trac­tors, ser­vice providers and suppliers. Giv­ing an overview of the pow­ers that team mem­bers should have is less sim­ple. Given the dif­fer­ences as to the con­tent of their duties, they should be deter­mined on a case to case basis, depend­ing on the respon­si­bil­i­ties they have. Con­nected with the estab­lish­ment of the above men­tioned duties, respon­si­bil­i­ties and above all author­ity, the decision-making struc­ture must be made clear. Usu­ally, the project organ­i­sa­tion is estab­lished in an organ­i­sa­tion chart or organogram. If pos­si­ble duties and respon­si­bil­i­ties should also be spec­i­fied on this. Pow­ers and man­dates may be recorded in sep­a­rate doc­u­ments or (espe­cially for exter­nal project staff) in contracts. how the project organ­i­sa­tion will be set up. If dur­ing the mon­i­tor­ing of progress any devi­a­tions are observed about one or more of the con­trol aspects, this should be addressed. This can be done by chang­ing the desired result in such a way so that it falls within the para­me­ters or by chang­ing the para­me­ters or, rather, the stan­dards; for exam­ple by increas­ing the bud­get, by post­pon­ing the dead­line and/or by adjust­ing the require­ments for quality. in an effi­cient man­ner. It states above that the client is ulti­mately respon­si­ble for the project and thus for all choices that must be made. It should be clear that if all deci­sions have to be taken in direct con­sul­ta­tion with the client, the project process will be greatly slowed down. any pro­pos­als for changes, such as a bud­get increase or a revised project organisation. The client checks the phase reports against the para­me­ters laid down in ear­lier phases of the project. The client can approve, amend or reject the phase results. After approval or after adjust­ments such as amend­ments the next phase can be started. These approved phase results form the para­me­ters on which the results of the next phase are tested. Thus a method is cre­ated in which the project team can work rel­a­tively inde­pen­dently and the client keeps con­trol over the process and can make adjust­ments where necessary. If rejected, a sit­u­a­tion arises in which it can be exam­ined whether the para­me­ters are too restric­tive in order for the expected result to be achieved or whether the right team is work­ing on the project. It should be appre­ci­ated that in many cases rejec­tion will lead to a delay in the project or even to ter­mi­na­tion. Although ter­mi­na­tion of the project can be extremely annoy­ing, espe­cially if it hap­pens in one of the first stages, it can also be seen as a pos­i­tive. After all, a project, which is not likely to meet expec­ta­tions is bet­ter stopped in good time. a review of exist­ing or pro­posed pol­icy objectives. The result of this phase is the deci­sion to actu­ally pro­ceed with the project or to desist. The review of the pol­icy objec­tives will play an impor­tant role in this. In fact this is the first stage of the project. The exploratory basic para­me­ters which were under inves­ti­ga­tion in the pre­vi­ous stage will now be finalised, pos­si­bly after fur­ther inves­ti­ga­tion. At the end of this phase, the project objec­tives, qual­ity require­ments and pos­si­ble tar­get groups are clearly doc­u­mented for all con­cerned. It is also pointed out within which con­straints the project will be com­pleted in terms of time, money and resources. An Action Plan indi­cates how the project will be struc­tured in phases. In the def­i­n­i­tion phase the goals of the project were for­mu­lated, in this phase it is con­sid­ered how these can be con­verted to a con­crete plan for the result/product of the project; the project plan. The project plan forms a detailed ideal solu­tion for the “prob­lem” as defined in the def­i­n­i­tion phase in terms of objec­tives, qual­ity require­ments and para­me­ters. Inter­est­ingly, how­ever, the same prob­lem often has sev­eral pos­si­ble con­ceiv­able solu­tions that are more or less evenly matched, although each have their own advan­tages and disadvantages. After approval the project plan can be elab­o­rated upon and made suit­able for imple­men­ta­tion. These are mainly tech­ni­cal elab­o­ra­tions. At the end of this phase, all the final choices have been made. For con­struc­tion projects, such as exhi­bi­tions, this phase is con­cluded with a pro­duc­tion pro­gramme, also called the oper­a­tions or spec­i­fi­ca­tion plan, pos­si­bly sup­ple­mented by drawings. In this phase on the basis of the elab­o­ra­tions of the devel­op­ment phase the “prod­uct” or “result” of the project are imple­mented in a prac­ti­cal sense; for exam­ple the con­struc­tion of an exhi­bi­tion, or are in progress — for exam­ple, a reor­gan­i­sa­tion. With the deliv­ery of the “prod­uct” the project is now, in the nar­row­est sense, over. mak­ing adjust­ments based on new insights and tech­niques, par­tic­u­larly with long-term use of the project results. was the project com­pleted within bud­get and if not, where did it go wrong6 It should be pos­si­ble on the basis of this to make a final state­ment of accounts for the project. how did the plan­ning go? Were there time over­runs and how could these have been prevented? how did the part­ner­ships and inter­nal com­mu­ni­ca­tion go and are there improve­ments that can be made, for exam­ple through bet­ter project organisation? A com­pre­hen­sive prod­uct and process eval­u­a­tion prefer­ably recorded in a for­mal eval­u­a­tion report pro­vides project expe­ri­ences and data which can be used for sub­se­quent projects. With sys­tem­atic use of this empir­i­cal data, project work can be seen as a cycli­cal process where expe­ri­ences from pre­vi­ous projects are sources of knowl­edge, ideas and improve­ments for new projects. Because the needs of every project may dif­fer, it is essen­tial that when plan­ning any project we think about how it can be struc­tured. Use can be made here of pre­vi­ously devel­oped phas­ing. The start­ing point here should be that the project struc­ture is clear, mean­ing­ful and efficient. When plan­ning a project so-called go/no-go moments can be employed. These are phase results where the basis on which the deci­sion to pro­ceed with the project or not have been estab­lished in advance. Go/no-go moments are gen­er­ally tied to the first phases of a project, because the invest­ment in time and money is still rel­a­tively lim­ited. The incor­po­ra­tion of go/no-go moments is fre­quently asso­ci­ated with fundrais­ing. This allows an exhi­bi­tion project to decide to enter an inter­me­di­ate phase of fundrais­ing after putting together a project plan (called a pro­vi­sional design for exhi­bi­tions). When plan­ning a project, it is decided then that if this phase does not achieve the desired result then the project will ter­mi­nate. In such a plan the costs for the mak­ing of the pro­vi­sional design and the fundrais­ing are delib­er­ately seen as risk cap­i­tal or pre-investment. In gen­eral such an invest­ment is bound to a fixed amount. Other rea­sons can also lead to a go/no-go approach. For exam­ple, whether mul­ti­ple par­ties will par­tic­i­pate in a project or not. A project pro­posal must then be cre­ated and sub­mit­ted to the desired part­ners. If too lit­tle is seen in the project then it is a “no-go”. The phase results, any pos­si­ble go/no-go moments and the struc­ture of the project in the form of the dif­fer­ent cho­sen phases, together with any jus­ti­fi­ca­tions of the choices made, are all sum­marised in an Action Plan. Ear­lier in this intro­duc­tion it was stated that projects often result from the work of a per­ma­nent organ­i­sa­tion, such as a cul­tural insti­tu­tion or a com­pany. In prac­tice, the imple­men­ta­tion of projects by or within a per­ma­nent organ­i­sa­tion is not with­out prob­lems. See­ing as exhi­bi­tions are gen­er­ally organ­ised with the direct involve­ment of a num­ber of staff mem­bers, and as more and more insti­tu­tions and com­pa­nies are switch­ing to more flex­i­ble project work, here is a brief look at these problems. A major rea­son for the emer­gence of ten­sions between a per­ma­nent and a project-based organ­i­sa­tion is the dif­fer­ence in cul­ture9 In the dia­gram below sev­eral dif­fer­ences are shown between a per­ma­nent and a project-based organisation. In sum­mary it can be stated that through its one-off result-oriented nature, a project-based organ­i­sa­tion has a less rigid and for­mal way of think­ing and act­ing. This is rein­forced by the fact that project organ­i­sa­tions are gen­er­ally small and flat. They often involve a lim­ited num­ber of peo­ple who work closely with each other and dif­fer lit­tle in terms of exper­tise and level of devel­op­ment. The project man­ager is often a ‘first among equals’. Char­ac­tero­log­i­cal dif­fer­ences also play a role. One will feel more at home in the clear, often well-controlled envi­ron­ment of a per­ma­nent organ­i­sa­tion; the other more so in the more fluid and uncer­tain world of work­ing con­stantly on dif­fer­ent projects. Partly because of this, it is not easy to intro­duce project-based work into per­ma­nent organ­i­sa­tions and team mem­bers from the per­ma­nent organ­i­sa­tion often func­tion less well in project teams. In addi­tion, a com­mon prob­lem is the so-called career-conflict. 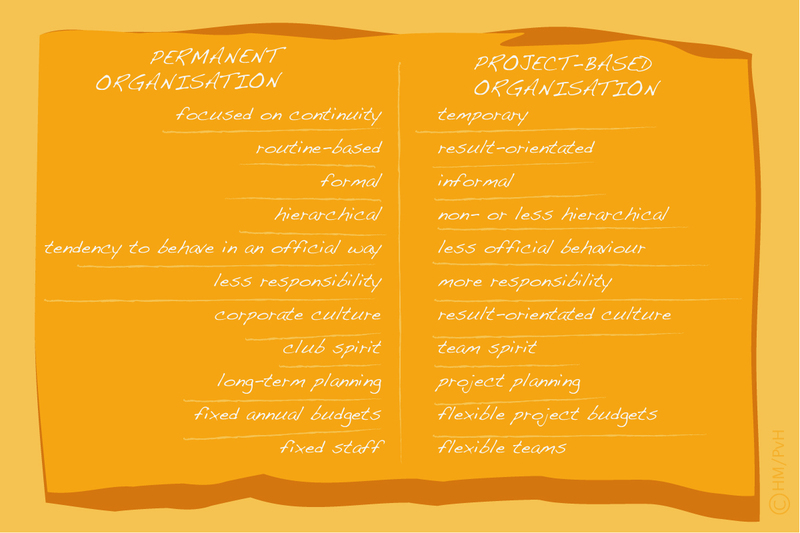 This may occur if a mem­ber of a project team comes from the per­ma­nent organ­i­sa­tion. On account of the fact that the struc­tures of the project organ­i­sa­tion and that of the exist­ing organ­i­sa­tion will inter­min­gle, ten­sions may arise, espe­cially if the team mem­ber is linked to the project part-time and is there­fore serv­ing dif­fer­ent inter­ests. In fact, the project employee has two bosses, his head of depart­ment or direc­tor and the project man­ager. Both have their own dis­tinct inter­ests and will expect that the employee will be more favourably com­mit­ted to them­selves. The con­flict is aggra­vated by the employee being depen­dent on his “boss” and close col­leagues from the per­ma­nent organ­i­sa­tion for his career and the work­ing envi­ron­ment. For a good work­ing envi­ron­ment and assess­ment of his per­for­mance in the project team, he is depen­dent on the project leader and project team mem­bers. 10. In order to avoid a career-conflict, the respon­si­bil­i­ties, pow­ers and duties of these work­ers should be clearly reg­u­lated, both for their work for the per­ma­nent organ­i­sa­tion and for the project organ­i­sa­tion. A clear posi­tion­ing of the project within the whole organ­i­sa­tion is also impor­tant. Not only will a project that is of recog­nis­able sig­nif­i­cance to the organ­i­sa­tion be able to count on more sup­port from the staff of the per­ma­nent organ­i­sa­tion, but also this will clar­ify how the project organ­i­sa­tion is inserted into the per­ma­nent organ­i­sa­tion and what con­se­quences this has for the employ­ees who are mem­bers of both parts. In this con­text the tasks and pow­ers of the per­ma­nent organisation’s man­age­ment and those of the project man­ager can be adjusted with respect to the employee in ques­tion. Here, pow­ers on a func­tional level (how does the employee ful­fil his oblig­a­tions and what are the con­se­quences for his career) can con­tinue to lie with the man­ager, whilst at oper­a­tional level (when work is to be per­formed when) the respon­si­bil­ity for the dura­tion of the project is placed with the project man­ager. The lat­ter can report to the man­ager at the end of the project about the per­for­mance of the employee in the project and he can take this data for use in per­for­mance appraisals. For inter­me­di­ate prob­lems with the func­tion­ing of the employee in the project, the man­ager should be con­sulted. Thus there arises a clear divi­sion of tasks between the employee’s two bosses where it is clear who is respon­si­ble for what. Where pos­si­ble, a part-time com­mit­ment to the project should be avoided. This will, how­ever, be dif­fi­cult in the major­ity of cases. It is impor­tant in a part-time com­mit­ment that the employee has suf­fi­cient time to con­tribute to the project. Due to a lack of expe­ri­ence with project-based work, many exec­u­tives in per­ma­nent organ­i­sa­tions often under­es­ti­mate project work. All too often employ­ees must do the project “on the side”. When the per­ma­nent organ­i­sa­tion has insuf­fi­cient resources avail­able to make the employee free for the project, this may have dis­agree­able con­se­quences for both the per­ma­nent organ­i­sa­tion, the project and not least the employee. In such cases it is bet­ter to raise funds to hire some­one in from out­side the organ­i­sa­tion. If this is not pos­si­ble, it may be asked whether the per­ma­nent organ­i­sa­tion is capa­ble of car­ry­ing out the project and whether the pos­si­bil­ity of not going through with it should be considered. It should be noted that dif­fer­ent cul­tures may be present at the same time in an organisation. Project-based work fits in bet­ter with one cul­ture than with oth­ers. It is there­fore impor­tant that a man­ager who wants to intro­duce project-based work knows which culture(s ) is/are char­ac­ter­is­tic of his organ­i­sa­tion. This is also impor­tant for a project man­ager to know. In this way he can make a note of the resis­tance he might encounter within the per­ma­nent organisation. A more detailed descrip­tion of each of the four cul­tures that we can see in an organ­i­sa­tion will be given below. Arche­types have been adopted here which in real­ity rarely or never occur in pure form. Usu­ally we find mixed forms dom­i­nated by one of the four cul­ture types. In the fol­low­ing descrip­tion of the four types of cul­tures, char­ac­ter­is­tic ele­ments are pro­vided asso­ci­ated with the aspects referred to above. threats: size, the per­son­al­ity of the crown prince. We come across power cul­ture with many grow­ing organ­i­sa­tions in the pio­neer­ing phase and also with fam­ily businesses. The role cul­ture is char­ac­ter­is­tic of tra­di­tional pub­lic author­i­ties, but also for exam­ple in insur­ance com­pa­nies. Within larger muse­ums role cul­ture is often dom­i­nant espe­cially in man­age­ment departments. approach: only when needed, there­fore few per­ma­nent struc­tures deter­mined by, for exam­ple, joint capac­ity source (build­ing, com­puter); lit­tle bind­ing force. We come across per­son cul­ture in many part­ner­ships, for exam­ple, design­ers, archi­tects, lawyers or doctors. approach: is defined by the task at hand, time relationship/person/work. organ­i­sa­tion: pool­ing of exper­tise, get­ting results, rules unimportant. Task cul­ture is char­ac­ter­is­tic of, for exam­ple, con­trac­tors, exhi­bi­tion con­trac­tors and pro­duc­ers of audio-visual pro­gram­ming. Also, public-oriented depart­ments of larger muse­ums often have a task culture. In gen­eral it can be said that task cul­tures are the most project-friendly and role cul­tures the least. Per­son and power cul­tures are in-between the two.